Cork is a great material to make coasters from, because it’s naturally water resistant. 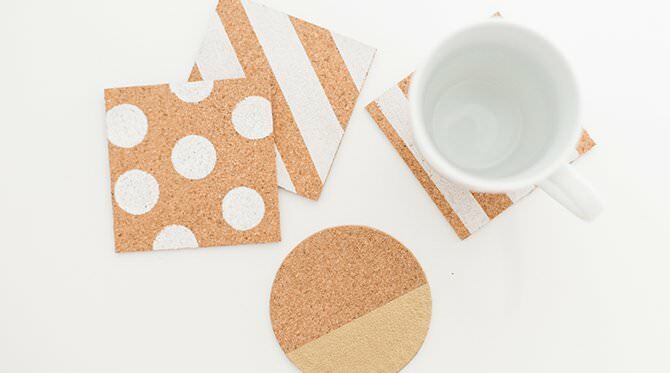 ‘Inspired by This‘ made these DIY “Dwell” inspired cork coasters in a just a short time, with inexpensive supplies you can get at any craft store. I would love to make these in copper or rose gold too! ‘Darkroom & Dearly’ has a DIY tutorial for their homemade polaroid coasters that are so retro cute. 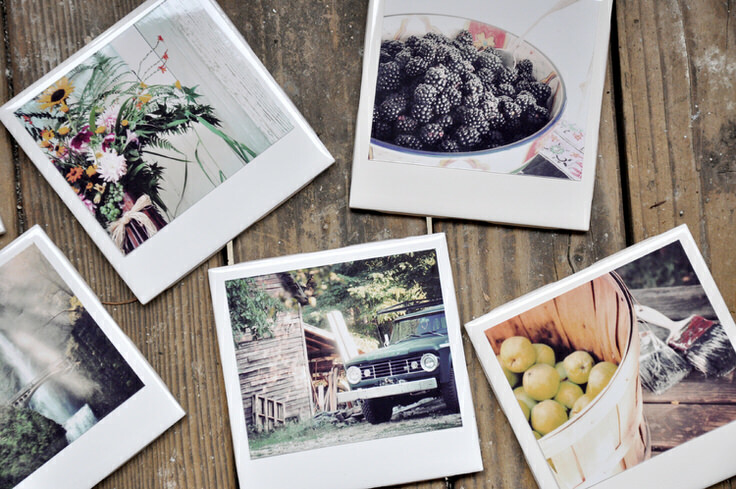 These actually are not polaroids, but they sure look like it! Really easy craft project with inexpensive 3×5 prints, Mod Podge, and some sealant spray on white tiles. Don’t forget to pay attention to her best tip : Use a filter on the photos before printing to give them that “antiqued” look… go find out how! 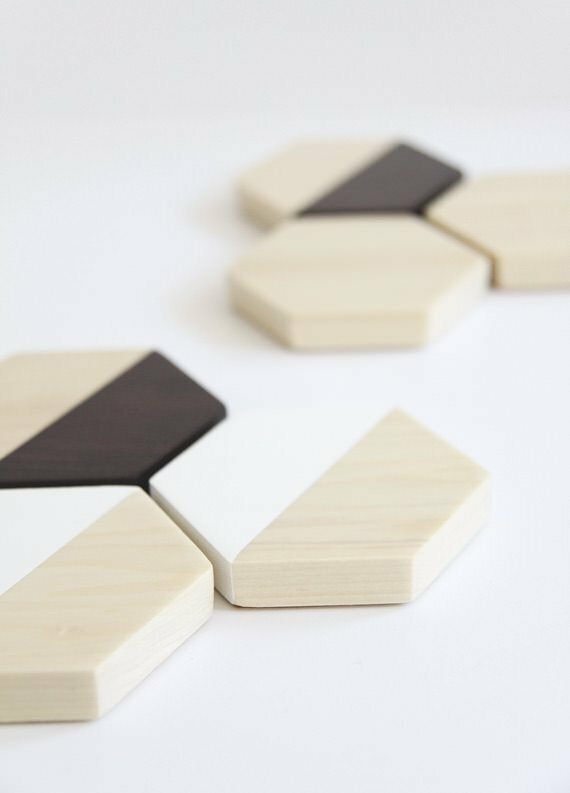 These DIY hexagon wood coasters from ‘Idle Hands Awake‘ are really cool. 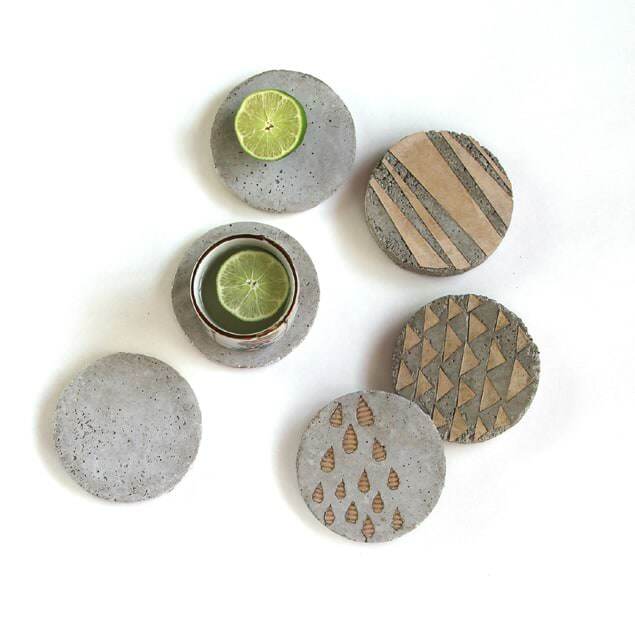 They look very West Elm to us, and I happen to know that W. E. coasters usually run around $40 for a set of 4! 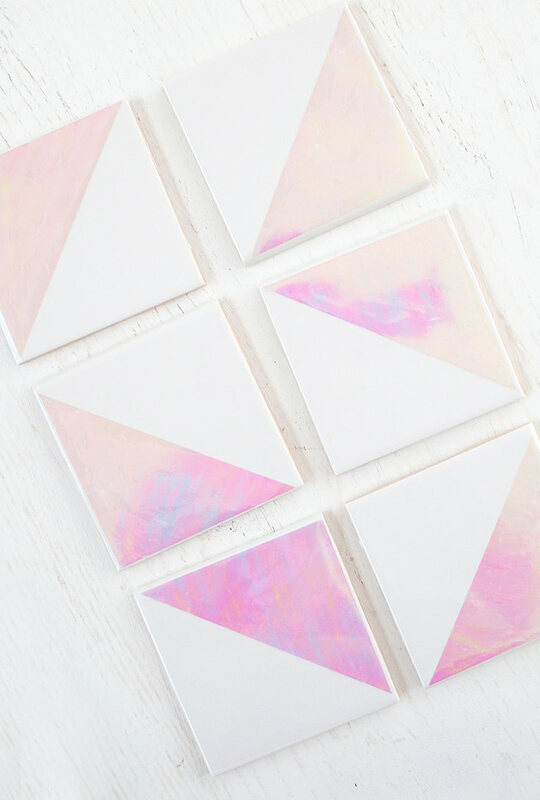 Loving on these DIY holographic coasters from ‘Love Vividly‘. These are made with foil paper on tile, and she tells you where to find the paper, too. I already can’t decide which DIY coasters I want to make! Ok, this is the epitome of cool. ‘A Kailo Chic Life’ (we love Kara!) 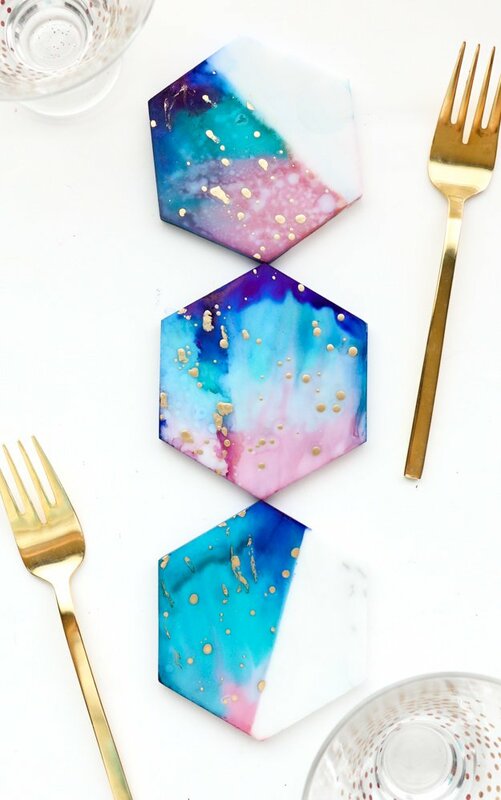 created these galaxy color blocked marble coasters that rock. These may look like complicated art, but they aren’t! Go check out the secret “paint” product that makes this project! Ok, let’s change it up now and try one with a little different feel. 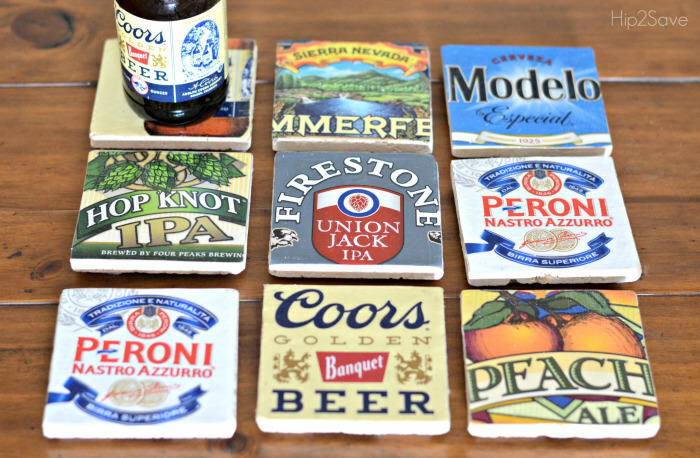 These DIY beer coasters from ‘Hip 2 Save‘ would be a great gift for a beer lover. Made from the actual cardboard beer cartons, these are really actually very “downtown pub”! 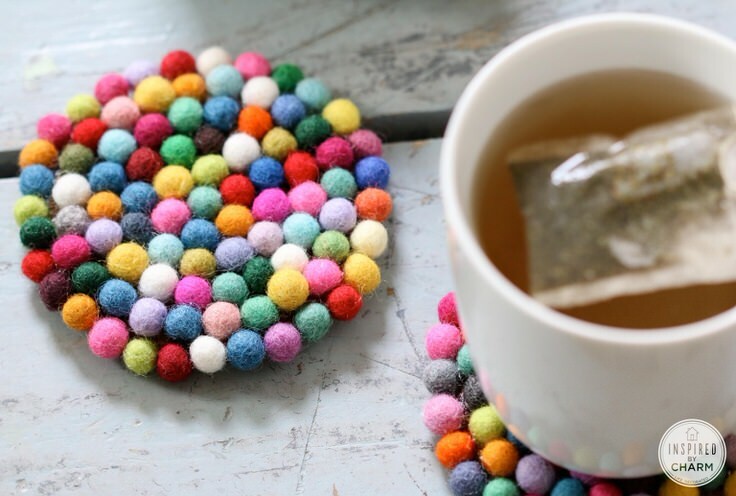 These DIY wool felt ball coasters are a fun and colorful project! And no, you don’t have to make the felt balls, he tells you where to find them. This is a simple glue job, and they look very Scandinavian chic to us. Imagine these in a neutral or all white room? From Michael at ‘Inspired by Charm‘. Next are these DIY coasters from ‘Homemade Ginger‘. 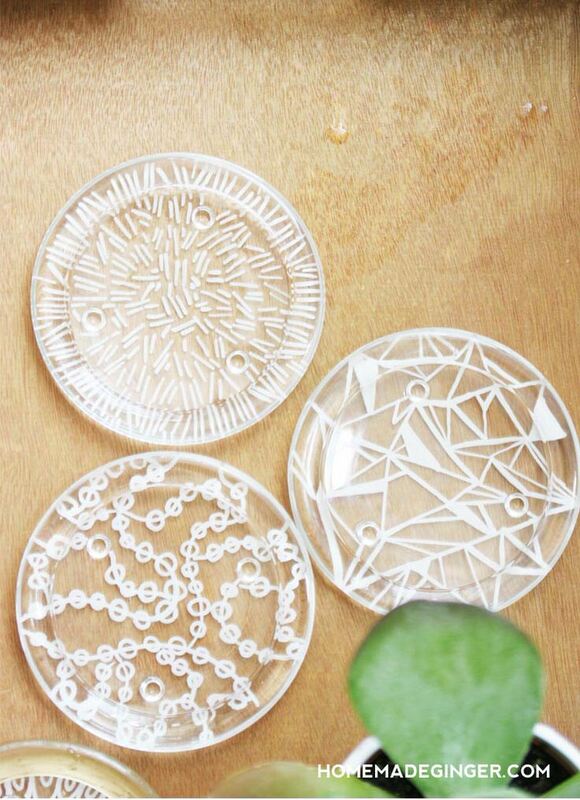 These are inexpensive glass candle plates (dollar store!) and a paint pen! Simple, subtle and elegant craft project. 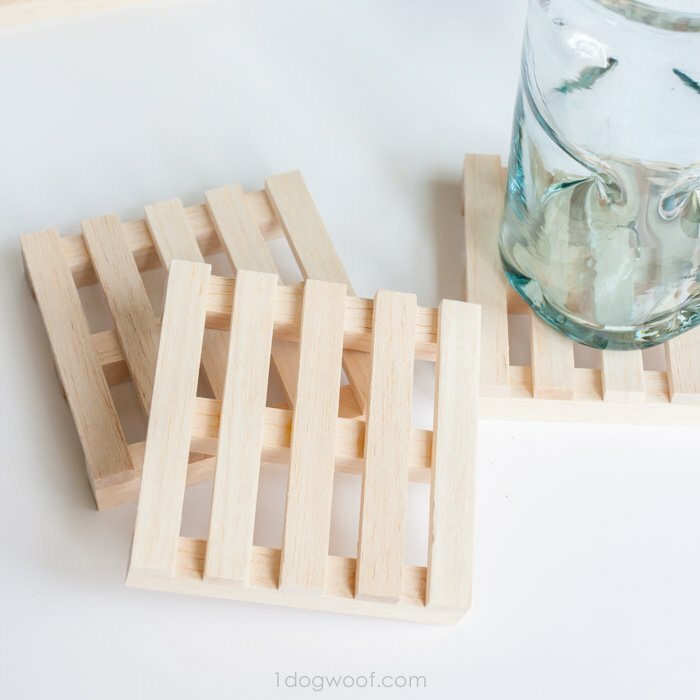 If you are a DIY’er and Pinterest fanatic like us, you will love these DIY wooden pallet coasters from ‘One Dog Woof‘. Made from rectangular or square dowels, this are just really fun and cute! Don’t these look expensive? 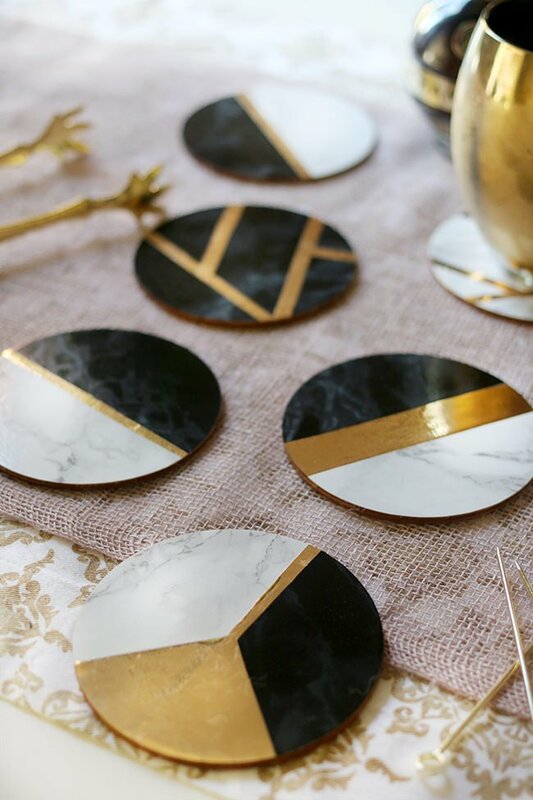 Well they are actually an easy DIY glam marble & gold coaster project from ‘Swoon Worthy’ that will prove otherwise. Made from contact paper and plain wood rounds, these just take a little work with a craft knife and a little patience. Can you believe there are this many amazing DIY coasters out there? We can’t stop! So moving on, ‘ClaireaBelleMakes’ has a simple but sophisticated project for us. 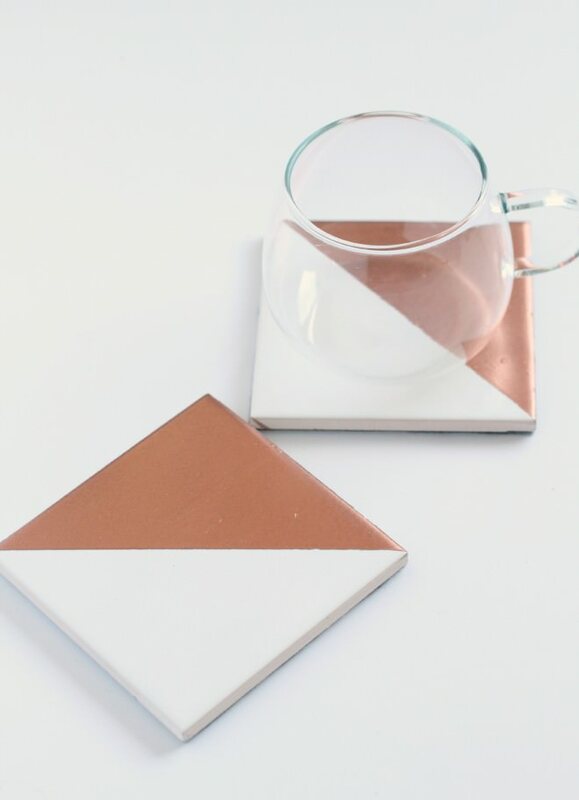 These geometric copper coasters are just some tile, tape and spray paint. She has one tip for you that will make the difference in this being amazing or not, so go check it out! Love the simplicity of these DIY stenciled wooden coasters from ‘The 36th Ave‘. The polka dots are my fav, but she has other designs too! Easy to follow tutorial from this craft project. We love working with concrete, its such a versatile and modern material. ‘A Piece of Rainbow‘ shows us how to make her DIY concrete coasters. I was really surprised at how she did the decorative inserts, and it really makes this project look special. 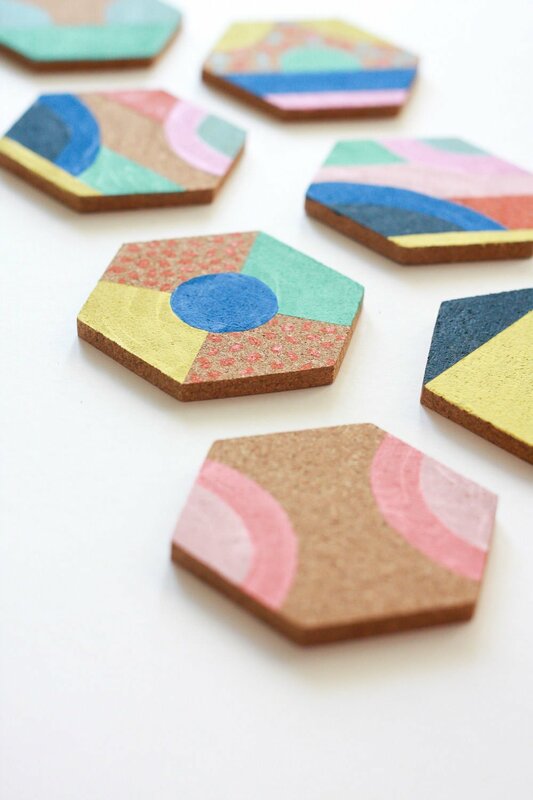 This colorful coaster DIY from ‘Jest Cafe‘ is so simple, and they are a fresh breath of air. Paint, cork, and some creative fun! 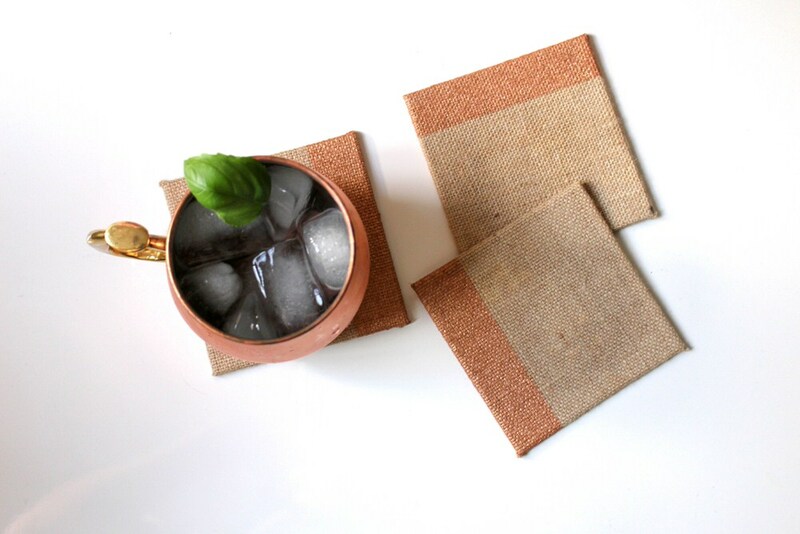 Finally, these amazing DIY copper and burlap coasters from ‘Twinspiration‘ took only 15 minutes to make! Love the texture of these with the burlap. Easy project! 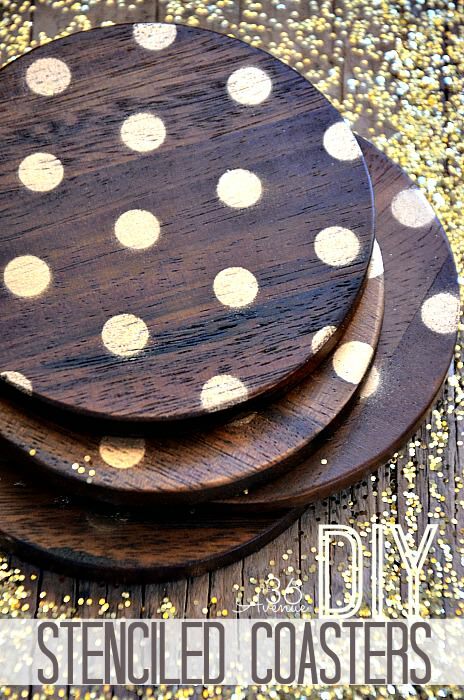 Did you love our round up on DIY coasters? Then jump on over to our post on DIY Area Rugs or Trending DIY Mirror Projects!